The Lions squared off against the Rams in the Sarachek final. Mar 31, 2009 — Chants of “M-T-A” and “R-A-M-S! Rams! Rams! Rams!” reverberated throughout the filled-to-capacity crowd at Yeshiva University’s Max Stern Athletic Center as hundreds of students, parents and alumni gathered to watch the 18th annual Red Sarachek Basketball Tournament championship game between the Yeshiva University High School for Boys / Marsha Stern Talmudical Academy (YUHSB) Lions and the Ramaz Rams—both of Manhattan. In the end, Ramaz’s defense proved too tough for the Lions as the Rams pulled away with a 48-26 victory. 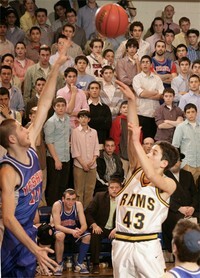 Daniel Klein, a senior guard for the Lions, echoed the coach’s sentiments. “We gave it all we had and it was exciting just being here,” Klein said. The championship capped off a week of thrilling basketball for the 20 teams participating in the tournament. The tournament, named for the legendary Bernard “Red” Sarachek—head men’s basketball coach at YU for over 25 years—was established in 1992 as a way to honor Sarachek’s accomplishments and contributions to the sport and the Jewish community. Since the inception of the tournament, nine different schools have been crowned champions. “The tournament provides students from diverse backgrounds with the opportunity to meet and compete with their counterparts,” said Michael Kranzler, YU director of undergraduate admissions. In addition to basketball, many players spent Shabbat together off-campus, leading to a sense of sportsmanship that could be felt throughout the tournament. Championships were awarded to the top four tiers with Ramaz winning Tier 1, Or Chaim winning Tier 2, Melvin J. Berman Hebrew Academy (Rockville, MD) winning Tier 3, and Shalhevet winning Tier 4.